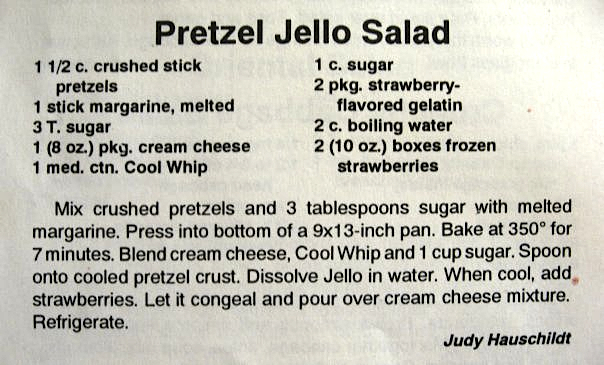 The Saint Henry’s parish cookbook contains 8 pages of Jello salads. Jiggling, technicolor side dishes (not desserts), spiked with mandarin oranges, crushed pineapple, frozen fruit, and/or mini marshmallows. Every Thanksgiving, my family turns to this book to make two Jello salads — a smooth orange one that somehow incorporates a box of vanilla pudding powder and a raspberry one with a pretzel crust and cream cheese-Cool Whip mantel. A few years ago, it became the grandkids’ task to put the salads and casseroles together while the aunts and uncles tended to the turkey and potatoes. I’d never fully respected these secondary dishes until I had to assemble them myself. Like many midwestern sides, most of ours involve opening a package of one thing and combining it with a package of another thing — there’s not a lot of chopping, peeling, or measuring. Thank you, creative 1950s housewives, for your green bean casserole. Once, my cousin accidentally put a box of Jiffy yellow cake mix, instead of corn muffin mix, in the corn casserole. No one was the wiser. My mom once got fancy and made a very Whole Foods-y baked root vegetable dish in place of the marshmallow-topped candied yams. She was nearly chased out of the house with pitchforks and told, in no uncertain terms, to never ever do something like that again. But back to the Jello. Jello salad, in all its forms, is ridiculous and hilarious and delicious. You could never get it at a restaurant (note to self: open this restaurant) and it tastes like sugary happiness. And I made myself copies of those recipes from the St. Henry’s cookbook, so even though Thanksgiving is no longer a giant feast in my grandma’s garage — it will always be wherever I bring the Jello salad. Substitute raspberry Jello for strawberry Jello! No marshmallow candied yams! Your mom knows how to write herself into a story sure to be repeated every year forever.